A singularly weird Japanese shooter that makes its own rules. Imaginative, beautiful, and utterly strange, but you’ll need to really love the story to endure its idiosyncratic combat. What is it? A surreal Japanese shooter. Morrissey lyrics scrawled on a wall in blood. A talking corpse wearing a t-shirt with the word FUNKY printed on it. A gift received from a severed head in a washing machine. These are just a few of the things you’ll encounter in Killer7, a bizarro PS2-era shooter that is now finally available on PC. It’s difficult to pin down exactly what Killer7 is. It has first-person shooting, third-person exploration, Resident Evil-style puzzles, and a selection of characters with unique abilities. But it combines these familiar ideas in a way that is totally original—and, often, utterly confounding. The story in Killer7 is labyrinthine and dreamlike, and prone to frequent, baffling tangents. But the general idea is that you are Harman Smith, an elderly man who is able to conjure up seven different personalities, each with their own particular skills in combat. Violence-loving Dan Smith is an ex-cop who wields a Dirty Harry-style revolver. Mask de Smith is a luchador who favours a pair of devastating grenade launchers. Kaede Smith uses a scoped pistol and can reveal secrets by, er, cutting her wrists and bleeding on them. There are more to discover, but you get the idea—and you can switch between them freely. One of the most curious design decisions in Killer7 is that there’s no freedom of movement or camera controls. The action is viewed entirely from fixed, dramatic angles, and your exploration is limited to holding a button to walk forward, and hitting another to turn around. This odd, on-rails system takes some getting used to, and can feel quite restrictive at times. But when you hear the eerie laughter heralding the arrival of an enemy, you pull out your weapon and switch to first-person, and are able to target them manually. You can’t move while shooting, however, and many enemies have a nasty habit of rushing you and exploding, which makes accuracy important: a skill made easier by the mouse controls in the PC version. This combat makes up the bulk of the game. 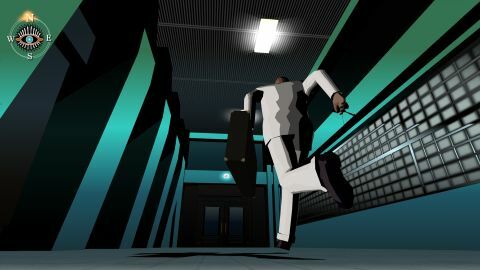 There are characters to speak to, those aforementioned puzzles, and an upgrade system, but despite its novel presentation, Killer7 is fundamentally a rather simple shooter. To the point where, if the story doesn’t grab you, you might actually find it quite tedious. The stingy save points don’t help in this regard either. But give yourself to the game, adapt to its peculiar rhythm, and it’s an experience like no other. The bold, stylised visuals, disturbing ambient music, and general oddness of the storyline and dialogue are hypnotic. It combines stark comic book violence, Lynchian strangeness, and Japanese game design sensibilities to compelling effect. And all the guns are named after songs by Pixies, Dinosaur Jr., and The Smiths, which is just cool. It’s hard to believe a big publisher like Capcom released something so challenging back in 2005. It’s the kind of provocative experiment you’re used to seeing come out of the indie scene, which makes it a perfect fit for a release on PC today. It’s a basic port with limited graphics options, but you’re not playing this for the tech: you’re playing it for the weird.